Parking for Med Inn is in Parking Structure P2. Remember the level on which you parked. Take the parking structure elevator P2 to Floor 2. Enter the Taubman Center and follow the Overhead Signs to Elevator 11. Take one of the Elevators in bank 11 up to Floor 3. 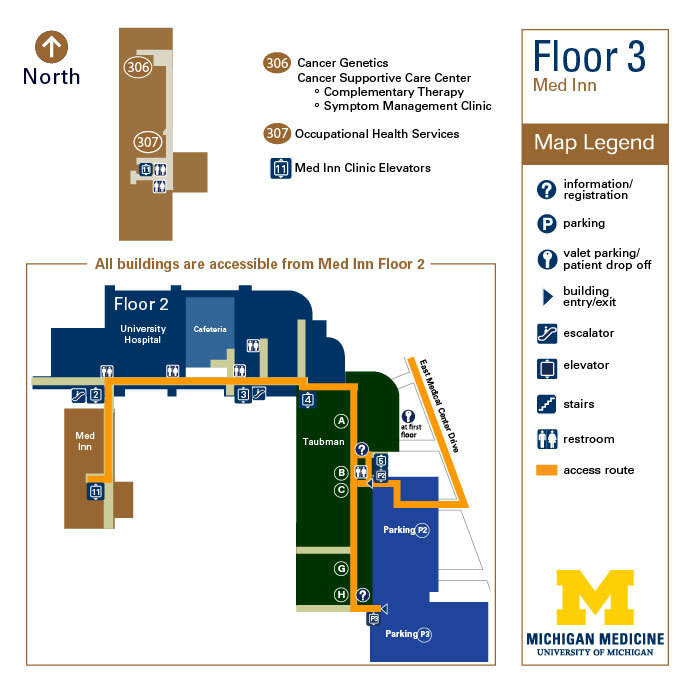 *Detailed directions to services located on Floor 3 of the Med Inn Building are listed below. Look for wall signage to assist you in finding your location. Turn right as you exit the elevator on Floor 3. Turn left around the corner, Occupational Health Services check-in will be on the left. Turn right as you exit the elevator on Floor 3. Turn left in the main hallway and follow the hallway to the end. Check-in will be on your left in Room C314.